To be honest…I don’t know if I have any quick go-to meals, but I’m adding tempeh tacos & buffalo tofu to my list! I can’t wait to try them out! The lentil and mushroom tacos are amazing. I also love replacing the “meat” part of tacos with veggies (like zucchini with added spices…). My favorite “I have no time” dinner is frozen veggies and protein, reheated and covered in salsa from a jar. Easy, easy. My BF is traveling for work all week adn I already have your linguine with clams on my menu plan while I’m cooking for one. I’m going to add the eggy pasta, too! The only quick, go-to meals I have come from the drive through… 🙁 But I am trying to change that! When I’m low on time, we always have eggs — on toast or omelets, scrambles, etc. We always have them in the house and just take a few minutes. To be honest we have eggs for dinner even when we have a ton of time — we just like them that much! I’ve never heard of that egg in pasta though — sounds interesting! Working late is killer when you still have to come home and make dinner. 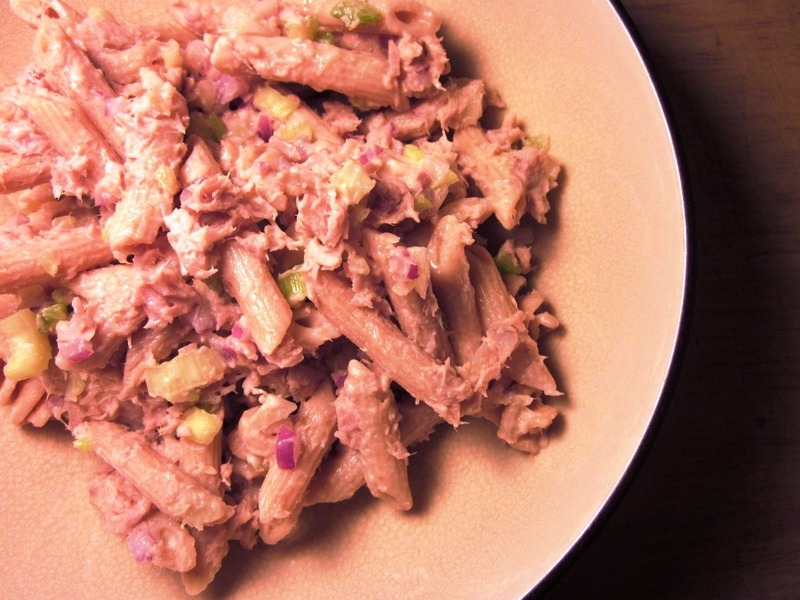 Crock pots are great for that, but sometimes, you just don’t have that time to prepare. Our go to fast meals are usually wraps or eggs or baked potatoes with broccoli or sometimes chili! Well after that post I should NEVER find myself without a meal (like I am today). My problem is I DON’T keep my kitchen stocked or I have a lot of items but not really items I can combine for a meal. My only suggestions would be, don’t let meal planning bog you down. When I first started, I would plan out 2-3 meals a week, and just plan to make enough extras for lunch the next day. I wouldn’t map out what days each thing would be, I’d just play it by ear when I got home (which I still do, to a degree). Maybe each time you go to the store for the next few weeks, pick up a few staples you can keep around the house (especially if they’re on sale!). I noticed canned tuna was 59 cents at CVS this week! I love the sweet potato + black bean combo. This weekend I hardboiled a dozen eggs, which has been awesome to have on hand to put together quick meals…except peeling them all was a b*tch. I also keep frozen veggie burgers on hand to have in a pinch. 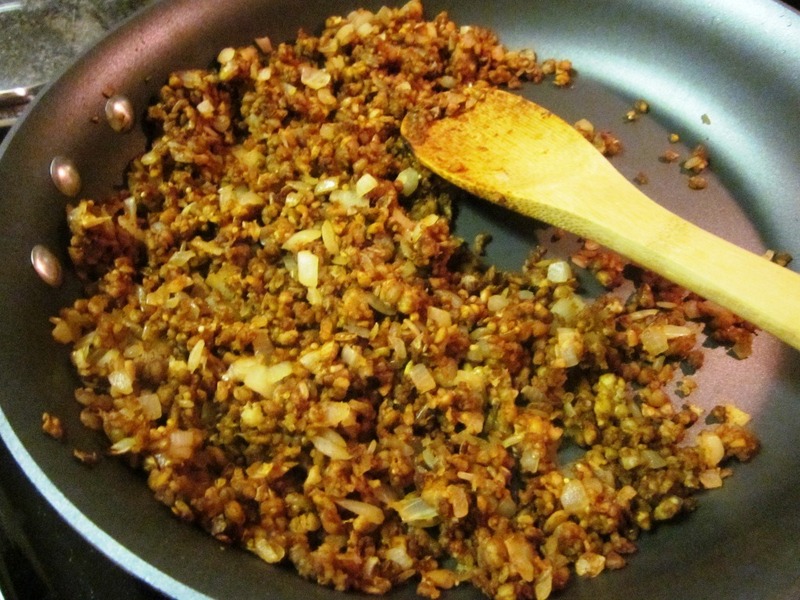 I shred a whole cabbage when I return from shopping and, at the beginning of each week, I cook a package of lean ground turkey with Mexican seasonings/onion. I use these ingredients throughout the week as my quick “go to” foods. The cabbage adds crisp to salads, becomes a quick “slaw” and is used for morning egg tostadas. 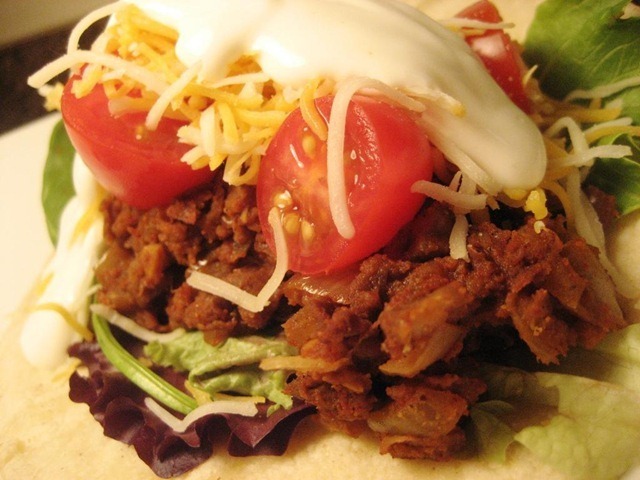 The Ground Turkey becomes taco filling and also tops salads. Ohhh I LOVE this idea for the breakfast tostada. Thank you! I usually rely on a Boca burger or egg. It’s the easy for cheesy! 🙂 I love seeing what you eat – it’s so balanced and totally divine on the flavor spectrum! I love using lentils and tempeh for tacos instead of ground beef now! You’re welcome! It’s really delicious like that and takes no time at all! I have been reading your blog for a few weeks now and have yet to comment. Just wanted to say how much I enjoy it and what fabulous progress you’ve made in healthy living. I was a yo-yoer on WW and have just started running myself. I loooove this post! I am going to try your Tempeh tacos this week! Yes! I love easy-to-make recipe posts! I totally want to try to your peanut sauce now, too! But, I just heard the worst news! (Well not the worst haha, but disappointing none the less!) I just discovered Trader Joe’s Peanut Flour this week…and fell in love. And now in some cruel twist of fate (ok a little dramatic again) I heard it has already been discontinued and the only supply left is what is on the shelves in the stores??? Have you heard this? So bummed! Thanks for the recipe ideas! They look awesome! Yes unfortunately I have heard this! I stocked up so I still have three full packages of it left, but I’ll have to figure out a solution for after then! mmmm the egg pasta sounds wonderful! Being a single mama with a very demanding 2 year old, our go to meal is a whole wheat tortilla with some scrambled egg whites (I just keep egg beaters egg whites on hand) and cheese. Fast, easy and ready in about 2 minutes, perfect for when she’s having a fit and mama is hungry! I usually throw in some spinach and mushrooms too! We’re having BBQ tofu tonight. In love with my Tofu Xpress as well! It’s such a great little tool! I love BBQ flavored anything – enjoy!! Stir fry is almost always my go to quick meal because I can just throw together whatever is in my fridge that needs to be eaten and it takes less than 20 minutes! I love egg white omelettes with goat cheese, spinach, and tomatoes. Plus I love to cook larger portions of meals I can keep in my freezer. I made a lovely quiche that I ate one serving for my dinner and froze the other 7 servings for me to grab for a quick meal. Plus nitrate free turkey breast+whole wheat bread+mustard+spinach=delish sandwhich! Honestly, I make a lot of the stuff the prior day. For instance, today I made 2 large drumsticks with seasoning (in my electric food steamer), so I could eat one today and have one with a meal tomorrow. I make rice to last 2 or three meals, when I make fish, I usually steam 2 or three fillets. The best is Swai. Its only 2 points for a fillet. It seems to be a type of white fish, and it actually gets more plump as it cooks. For go to snacks, I keep little baggies with pretzels, popcorn, or “full bars” (a type of filler granola bar), and I wash and set aside my fruits for the next day or early in the morning after I feed my baby. The key is not to do things at the last minute or all day long. That is tiresome and you will end up ditching whatever you’re trying to accomplish. Try the day before, night before, or early that same day. And always keep things on hand that you have already calculated the points for or already “bagged” up according to serving sizes. I did weight watchers around 12 years ago, and a lot has changed with them, but I prefer the old method so I collected all the information online myself. And guess what, 8 pounds in less than a week.